a pyrimidine base found in ribonucleic acid (RNA). Pyrimidine (base) present in ribonucleic acid. /ura·cil/ (ūr´ah-sil) a pyrimidine base, in animal cells usually occurring condensed with ribose to form the ribonucleoside uridine; the corresponding deoxyribonucleoside is deoxyuridine. Symbol U. A pyrimidine base, C4H4N2O2, that is an essential constituent of RNA. a pyrimidine base found in RNA. Pairs with adenine. See also thymine. One of the 2 nitrogenous pyrimidine bases in RNA, which pairs with adenine and combines with ribose. A pyrimidine (base) present in ribonucleic acid. One of the four bases that form the nucleotide code in RNA. Fig. 310 Uracil . Molecular structure. one of four types of nitrogenous bases found in RNA, having the single-ring structure of a class known as PYRIMIDINES. Formula: C4H4N2O2. See Fig. 310 . 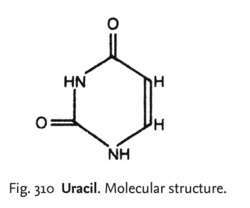 Uracil always forms complementary pairs with a base called adenine in DNA (during TRANSCRIPTION) or RNA (during TRANSLATION). U; Ura; a pyrimidine base found in nucleic acids. Cytosine is converted to uracil, most probably at the nucleotide or nucleoside stage . The presence of amide group in uracil was found by stretching vibration frequency near 1680-1630 cm-1. The values Gb, Gx, Kb and Kx for uracil derivatives with CTAB and SDS are listed in Table- 1. Uracil in DNA-general mutagen, but normal intermediate in acquired immunity. 7] mutagenized cells were spread onto 5-FOA plates containing uracil and uridine, and then were incubated at 30[degrees]C up to one week. This model is consistent with coordination potential between hypoxanthine and uracil, however, several other structures are possible. Investigations of glutathione S-transferase (6), hemoglobin (7), uracil N-glycosylase (8), chorismate metabolism enzymes (9), and hypothetical protein targets associated with a structural genomics program (10) are representative of these efforts. cerevisiae INVSC1 (Invitrogen, Carlsbad, CA) and transformant were selected on solid media lacking uracil [SC-ura with 2% (w/v) glucose--Adams et al. The pyrimidines uracil and orotic acid are formed directly from HCN, whereas uracil and cytosine are formed from cyano-acetylene [ILLUSTRATION FOR FIGURE 2 OMITTED](3). He isolated two different purines, adenine and guanine, and three different pyrimidines, uracil, cytosine, and thymine. The company's lead product candidate, PSI-7977, an unpartnered uracil nucleotide analog, has recently been advanced into two Phase 3 studies in genotype 2 and 3 patients. There's also a difference in that, while the bases adenine, guanine, and cytosine are common to both RNA and DNA, the DNA base thymine is substituted by uracil in RNA.